GRAND RAPIDS â An old and blighted city neighborhood is about to get a shiny new park. City commissioners were poised to approve a $500,000 construction contract Tuesday that will transform Joe Taylor Park into a 2.2-acre recreation area that will feature a water park, restrooms, a picnic shelter and playground equipment. The project fulfills a dream for residents whose neighborhood that had the least green space in the city, said Marian Barrera-Young, a crime prevention organizer for the Baxter Neighborhood Association. “I think overall, it’s going to be good for the kids. They were playing in the streets,” Barrera-Young said. The expanded park will be surrounded by houses that face the park, creating a safe area for neighborhood children, she said. 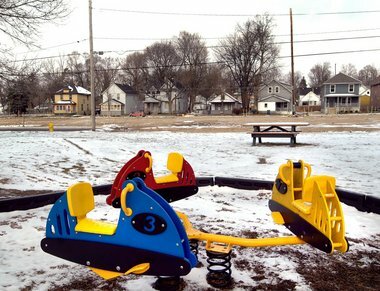 Joe Taylor Park began humbly in 1976, when several houses were demolished and combined with vacant lots to create an open space, city Parks and Recreation Director Jay Steffen said Monday. It was named Baxter Green until 1992, when it was renamed for Joe Taylor, a city police officer who was shot and killed in 1986 as he and fellow officers searched for a murder suspect hiding in the neighborhood. In 2003, the park received an upgrade when Universal Forest Products Inc. and Kaboom!, a national nonprofit group, installed playground equipment. The seeds for the latest expansion were sown in 2004, when the city purchased and demolished four blighted homes along Baxter Street SE, clearing an entire block for an underground storm water retention facility that was part of the city’s sewer rebuilding project. After it was completed this summer, the storm water project left behind a large open lot on which the current park will be expanded. 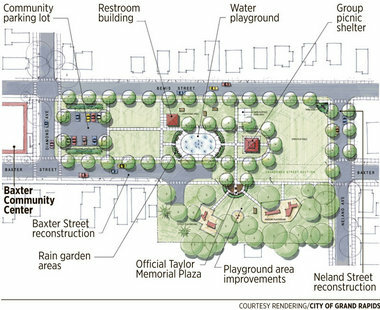 The project also closed off Baxter Street, creating an L-shaped park that preserves the playground. The new park also will feature a porous parking lot that can be used for overflow by neighboring Baxter Community Center, Steffen said. Water used by the spray park will be used to irrigate the park’s plantings, he said. “We are really looking for this to be a model of sustainable design,” Steffen said. Construction should be complete by summer, he said. Aimed at children and families, the new park will not have the type of hard-surfaced courts and game areas that can be found several blocks away at Martin Luther King Park, said Steve Faber, executive director of Friends of Grand Rapids Parks.